Iasi, Romania. Synagogue. Photo: ISJM files, photographer and date unknown. 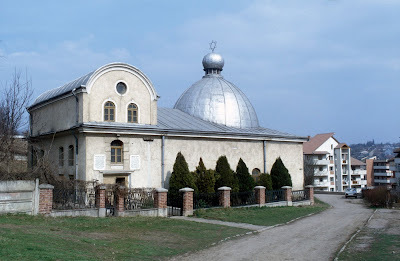 Ruth Ellen Gruber writes on her blog that the historic Great Synagogue in Iasi, in northern Romania, is under restoration. The 1671 synagogue was the oldest surviving synagogue building in Romania. Iasi had scores of synagogues before the Holocaust. Ruth writes: "The synagogue has simple lines and tall dome and is set in a small garden, almost totally surrounded by new buildings. Inside, a huge, elaborate Ark, surrounded by frescoes, fills one end of the hall. The former women's gallery for years housed a small exhibit on local Jewish history, organized in the 1980s."